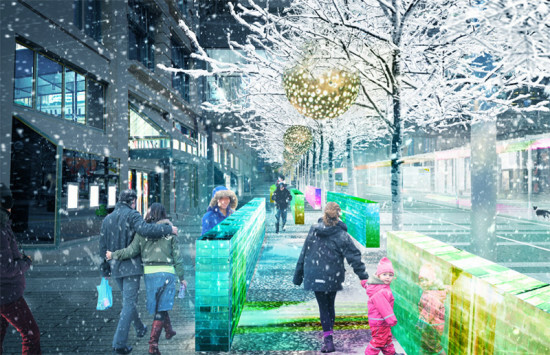 Minneapolis’ James Corner–designed Nicollet Mall redevelopment project has hit a speedbump as an initial construction bid has come in at over $24 million over the $35 million construction budget. The Nicollet Mall is a 50-year-old pedestrian and transit street in the heart of Minneapolis. Historically the commercial center of the city, the mall was given over to pedestrians, buses, and taxis in 1965 in an attempt to bring shoppers back from the suburbs, and the growing popularity of enclosed malls. Edina, MN, a suburb of Minneapolis, is home to the first enclosed modern mall in the U.S., designed by Victor Gruen in 1956. The Nicollet Mall was given a makeover in the 1980s as well, but it has been nearly 30 years since the Mall has seen any major improvements. The new plan, based on a competition winning design by James Corner Field Operations, incorporates a series of event spaces along the street to engage the public. A two-block mirrored canopy walkway, a “reading room,” improved transit stations, and a theater in the round will activate the 12-block stretch of the downtown public space. Each end of the Mall will also include a “Wood” where more intensive green spaces will include larger native trees. The overall planned budget for the two year project is $50, but with only one construction company submitting a bid for $59 million for the construction alone, the projects organizers are having to rethink parts of their plan. The first step that may be taken is rethinking material choices for the project. One of the main sticking points in the budget is the plan for eight acres of the Mall to be paved in custom concrete tile pavers. Officials say that the main design elements for the project will not be sacrificed though in the new plan, and more bids will be solicited in February based on an altered design. To entice a more varied size of contractors, instead of one single bid, it is also likely that the project will be broken down in to smaller, more manageable segments. Major construction is still expected to begin in spring of 2016, with the completion date set for summer 2017. 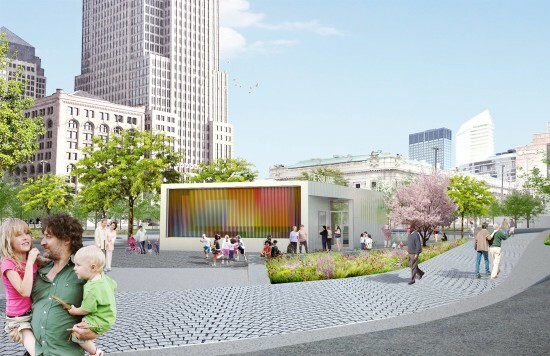 New renderings for one of the largest public space projects in the Midwest have been revealed, showing a new 2,500-square-foot “Café Pavilion” in Cleveland's Public Square. Brooklyn's nARCHITECTS designed the structure, which appears in renderings via project lead James Corner Field Operations. It will be the only structure on the 10-acre square, besides the existing Soldiers and Sailors' Civil War monument. Cleveland's Public Square is the subject of a major overhaul led by designers and engineers at at James Corner Field Operations, Cleveland's own LAND Studio and Westlake Reed Leskosky, as well as transportation consulting firm Nelson/Nygaard. The project aims to remake the splintered downtown park into a pedestrian-friendly destination that will catalyze development in the area. The cafe structure will serve as a billboard for that transformation. A curated “art wall” faces out, beckoning pedestrians passing by Terminal Tower and acting as the primary entrance to Public Square. Stainless steel panels and tall glass windows broadcast modernity on the building's other faces. “As a building with no back, each side of the Café Pavilion is meant to be a unique ‘front’ façade that offers a different experience,” reads the project description. The cafe, currently under construction, is expected to open in 2016. Have you ever wanted to go to the park but had a highway or rail yard in your way? Ever feel like the best parts of your city are disconnected? Do what Rotterdam- and New York–based designers Zones Urbaines Sensibles (ZUS) did. 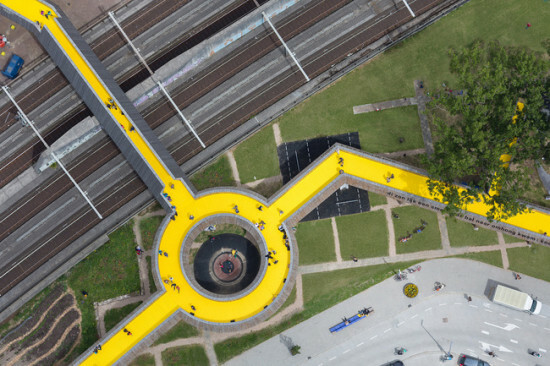 They wanted to connect parts of Rotterdam, so they took matters into their own hands and put together a crowdfunding initiative to connect a series of three districts through public infrastructure. Luchtsingel, a 1300-foot-long bridge received support from some 5,000 people and finally opened last week. The saga started in 2011 when the city cancelled the development of an office building in Rotterdam Central District. ZUS took over what is known as the Schieblock, and turned it into a city laboratory. The space acts as an incubator for young entrepreneurs and includes a ground-floor store, bar, culinary workshop, information center, and the Dakakker, Europe’s first urban farming roof. When the Delftsehof nightlife area and two parks opened, Pompenburg Park, and the Hofplein Station Roof Park, the districts needed to be connected. As part of the 2012 Architecture Biënnale Rotterdam (IABR), co-curated by ZUS, the area was named “Test Site Rotterdam,” and included 18 interventions connected by the Luchtsingel. The crowd-funding project “I Make Rotterdam” sold over 8,000 boards inscribed with the names of those who donated, for just €25 each. Not all 18 proposals were but the Luchtsingel has now happened. The project is a unifying factor in the resurgence of Rotterdam as a sustainable and pedestrian-friendly urban area, and uses “the city's evolutionary character and existing forms as a starting point. Therefore, we have developed new instruments for design, financing, and planning" to make "a new three-dimensional cityscape," according to ZUS founders Elma van Boxel and Kristian Koreman.